Paints & coatings are substances which are applied on a substrate to decorate and protect the surface. Paints and coatings are widely employed for decorative purposes. When used for decorative purposes, they improve durability and esthetic appeal of the surface. They provide protect the surface from factors such as environmental conditions, weathering, rust, and chemical resistance. Increasing demand for paints & coatings from several end-use industries such as automotive, construction, marine, aerospace, protective, transportation, wood coatings, and packaging is driving the paints & coatings market. Expansion of the paints & coatings market can be attributed to rise in investments by key players to developing efficient and cost-effective products, expansion, and mergers & acquisitions. The paints & coatings market has been segmented based on resin type, technology, application, and region. In terms of resin type, the market can be segmented into acrylic, polyurethanes, polyesters, epoxy, alkyd, and other resins such as silicone, polyvinyl acetate (PVA), and vinyl ester. The acrylic resin segment dominated the paints & coatings market in 2017. This dominance can be attributed to the growing use of acrylic resins in applications such as automotive, roof coating, wall coating, and construction. Based on technology, the paints & coatings market can be classified into water-based, solvent-based, high solid, power, and others such as UV-curing technology. The water-based segment dominated the paints & coatings market in terms of volume. The water-based paints & coatings find applications in automotive, interiors of coal cars, fly ash hoppers, plastic pellet hoppers, and the architectural sector, as they offer advantages such as less flammability, low VOC emissions, and stable viscosity during printing. In addition to low toxicity, their high water content makes water-borne coatings less flammable and hazardous. In terms of application, the paints & coatings market can be divided into automotive & transportation, aerospace, building & construction, packaging, health care & medical devices, marine, electrical & electronics, and others such as wood working. The building & construction segment is projected expand in the next few years due to the rise in urbanization and population globally. Urbanization and changing lifestyles are expected to drive the global construction industry in the next few years. Growing population and improving economic conditions have led to rise in expenditure on housing and infrastructure development across the globe. Based on region, the global paints & coatings market has been segregated into North America, Europe, Asia Pacific, Latin America, and Middle East & Africa. Asia Pacific is a leading consumer of paints & coatings in the world. The market in the region is likely to expand at a rapid pace in the next few years. Rise in consumption of paints & coatings in the region is attributed to the increase in the number of building & construction and improvements in the industrial infrastructure in the region. High degree of competition exists among market players operating in the paints & coatings market. The market is dominated by a few major players and is moderately consolidated. Key players operating in the market include The Sherwin-Williams Company, BASF SE, Axalta Coating Systems, PPG Industries, Valspar, Akzo Nobel N.V, Nippon Paint Holdings, KCC Corporation, and Jotun A/S. 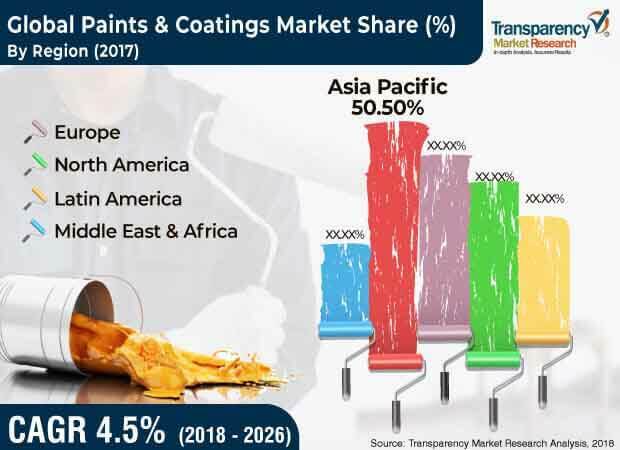 The paints & coatings market is driven by increasing demand for paints & coatings from several end-use industries such as automotive, construction, marine, aerospace, protective, transportation, wood coatings, and packaging. Expansion of the paints & coatings market can also be attributed to the increase in investments by key players to launch of efficient and cost-effective products, expansion, and merger & acquisition. The paints & coatings market has been segmented based on resin type, technology, application, and region. In terms of resin type, the market has been segregated into acrylic, polyurethanes, polyesters, epoxy, alkyd, and other resins, which include silicone, polyvinyl acetate (PVA), and vinyl ester. The acrylic resin segment dominated the paints & coatings market in 2017 due to the growing use of acrylic resins in many applications such as automotive, roof coating, wall coating, and construction. Based on technology, the paints & coatings market has been classified into water-based, solvent-based, high solid, power, and others, which include UV-curing technology. The water-based segment dominated the global paints & coatings market, in terms of volume. Water-based paints & coatings find application in, fly ash hoppers, plastic pellet hoppers, the automotive industry to coat coal cars interiors, and the architectural sector, as they offer advantages such as less flammability, low VOC emissions, and stable viscosity during printing. In addition to low toxicity, their high water content makes water-based coatings less flammable and hazardous to the environment. In terms of application, the paints & coatings market has been divided into automotive & transportation, aerospace, building & construction, packaging, health care & medical devices, marine, electrical & electronics, and other such as wood working. The building & construction industry is projected to grow in the next few years due to the rise in urbanization and population globally. Urbanization and changing lifestyles are expected to drive the global construction industry in the next few years. Growing population and improving economic conditions increase expenditure on housing and infrastructure developments across the globe. Based on region, the global paints & coatings market has been segregated into North America, Europe, Asia Pacific, Latin America, and Middle East & Africa. Asia Pacific is a leading consumer of paints & coatings in the world. The market in region is likely to expand at a rapid pace in the next few years. Rise in consumption of paints & coatings in Asia Pacific is attributed to the increase in the number of building & construction and improvements in the industrial infrastructure in the region. Europe and North America account for large share of the global paints & coatings market. Expansion of the market in these regions is likely to slow down due to the sluggish expansion of the end-use industries. The report analyzes and forecasts the paints & coatings market at global and regional levels. The market has been forecast in terms of volume (kilo tons) and revenue (US$ Mn) from 2018 to 2026. The study includes drivers and restraints of the global paints & coatings market. It also covers the expected impact of these drivers and restraints on the demand for paints & coatings during the forecast period. The report also highlights growth opportunities for the paints & coatings market at the global and regional levels. The report comprises a detailed value chain analysis, which provides a comprehensive view of the global paints & coatings market. The Porter’s Five Forces model for the paints & coatings market has also been included to help understand the competition landscape. The study encompasses market attractiveness analysis, wherein segments have been benchmarked by resin, technology, and application based on their market size, growth rate, and general attractiveness. The study provides a decisive view of the global paints & coatings market by segmenting it in terms of base resin, technology, application, and region. These segments have been analyzed based on present and future trends. Regional segmentation includes current and future demand for paints & coatings in North America, Europe, Asia Pacific, Latin America, and Middle East & Africa. The report also covers segmentation based on individual by resin, technology, and application of the market in all regions. The study includes profiles of major companies operating in the global paints & coatings market. The paints & coatings market is dominated by large players. Key players operating in the market include The Sherwin-Williams Company, BASF SE, Axalta Coating Systems, PPG Industries, Valspar,, Akzo Nobel N.V, Nippon Paint Holdings, KCC Corporation, and Jotun A/S. The report provides the estimated market size of the global paints & coatings market for 2017 and forecast for the next nine years. The size of the global paints & coatings market has been provided in terms of volume and revenue. Market numbers have been estimated based on resin, technology, application, and region. The market size and forecast for each resin, technology, and application segment has been provided for the global and regional markets.